We have a Judy Niemeyer Place Mat class on Tuesday, 4/3 that will not make unless we have at least one more person to sign up. It is called My Two Baby Sisters (for two stars) and is on our website. The cost is $50 for Judy's training time and the pattern is $25.84. There is no kit. We offer these classes to keep our newcomers abreast of the paper piecing techniques and for those wanting extra experience with the Quiltworx patterns. If you are interested and these dates don't work for you, please let us know so I will know how to plan future offerings. We have cancelled two of the Niemeyer classes now. We will stop offering them if we are a saturated market. The second class I need to highlight is Ficklesticks (The Art of Fabric Jewelry) on 4/28 taught by our own Bonnie Kastler. The kits are $29 of the $40 fee, so there is very little training fee tied to this class. Just something fun to do on the weekend for you working ladies! Please sign up early so that we know how may tool kits to have on hand. The last class I need to highlight is Embroidery Software Training 4/11. This software is designed by Bernina, used on a computer and converted and transferred to ANY machine through a USB. It is used to manipulate designs you already own, dissect designs to use as partial designs, enlarge them and even use a picture to digitize and stitch your CAT! It is not exclusively for Bernina machines. It is Bernina designed software. 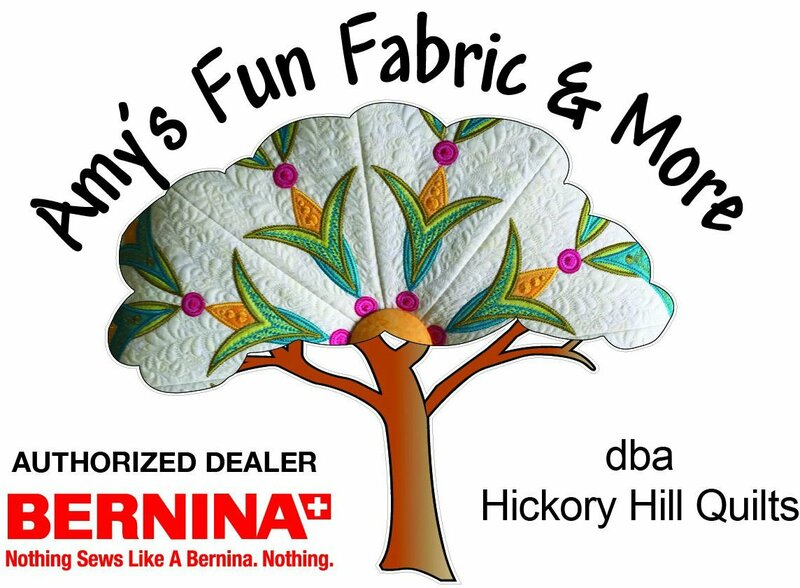 Debbie Lashbrook, the Bernina expert on the Embroidery Soft and interface to the design team will be here to demonstrate and acquaint you with its features. If you have the software you can bring your laptop and do the exercises as she does and ask questions! 4/6 Moved to 4/13 due to Michelle's Surgery: Advanced Beginner Quilting (mitered-corner boarders, sashing, cornerstones, On-Point, Flying Geese, Quarter-square Triangles, Square in a square, Curved piecing, setting blocks on point) Stay tuned on this date as Michelle had shoulder surgery and we will be checking in to see if she can facilitate this class post surgery. 4/21 Open Sew/Pot Luck!!!! Italian Theme - I'm doing stuffed manicotti! Bring your best dish to share! We need salads, garlic bread, desert (always! ), spaghetti....anything you want to bring. 4/25 Prerequisite to the Westalee Free Motion Ruler BOM with Michelle Jones - Beginning Free-Motion Ruler Training. If you have had this in the past, you are free to sign up for the BOM she will be teaching beginning 5/9. 4/27 Change: Advanced Beginner Quilting Sessions 2 & 3 will be all day due to a compressed schedule as a result of Michelle's surgery. Session 4 & 5 will be all day again on Friday 5/4. 4/28 ART PROJECT CLASS: FICKLESTICKS - See notes above! 5/5 Master Class Starts Over with Session 1 for all new owners!